The middle of the night wake-up is one of the most frustrating parts of parenting. You’re tired, baby’s tired, but nobody’s getting any sleep! It’s a fact of life: Babies need around-the-clock care for feedings, diaper changes and simply because their sleep cycles transition faster than ours do. 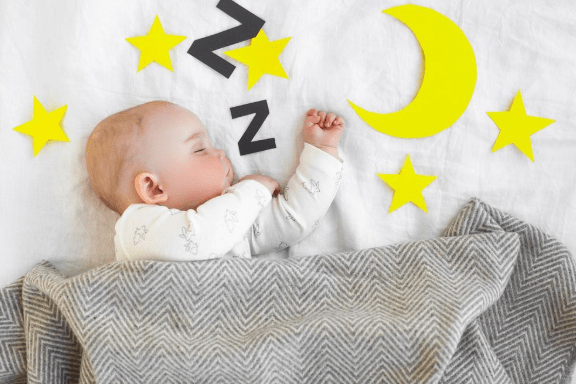 Understanding how to get baby back to sleep as fast as possible can help you get yourself back to bed, too, so you can soak in those much-needed zzz’s. Make sure that you’ve created an ideal sleep space for baby—it should be dark, quiet, cool and safe from crib hazards—and that you’ve dressed baby in safe, comfy pajamas so nothing interrupts her sweet, sweet sleep! Here are some more smart hacks for getting baby back to sleep in the middle of the night. Share a Room, but Not a Bed—The American Academy of Pediatrics (AAP) Safe Sleep Recommendations are clear—room-sharing is good, co-sleeping is bad. In fact, the AAP says that room-sharing can decrease the risk of SIDS by as much as 50 percent, but that parents should never share a sleeping surface with baby. Sharing a room with baby for her first few months of life means you can provide her with what she needs when she needs it, which translates to better, longer rest. She’s likely to fall asleep quicker if she knows you’re nearby and you’ll be able to tell immediately if there are any disruptions to her environment, ideally before she wakes. Rock A Bye Baby—Your rocking chair will really come in handy during your infant’s first few weeks at home. A gentle, rocking movement can help relax her if she’s wide awake, so she’ll fall asleep faster and stay asleep longer. But rocking, like any soothing-to-sleep approach, is somewhat controversial. You don’t want to create a sleep association so that your child can only fall asleep when she’s rocked. Unfortunately, you can’t rock your baby to sleep until he or she heads off to college, so it’s best not to overdo the rocking. Healthy rocking means rocking until baby becomes drowsy (not fully asleep) so she ultimately falls asleep when she’s in her crib, creating an association with her space rather than the movement or the person doing the rocking. 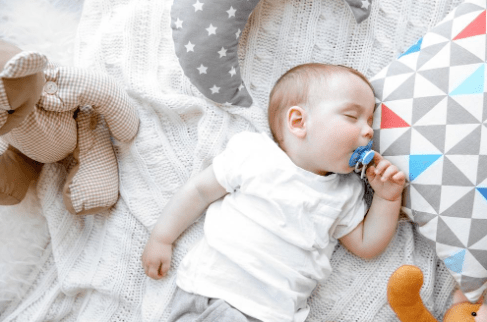 Let the Pacifier Save the Day (or Night)—The pacifier is an undeniable bedtime hero for many parents, so don’t be afraid to use it during naps or when you put baby in her crib at night. The AAP actually recommends using a pacifier during sleep times because it’s proven to reduce the risk of SIDS. However, make sure that you use the paci the right way. Never put baby to bed with a pacifier attached to clothing or any other object that could increase the risk of suffocation or choking. The pacifier is similar to rocking—it should be used strategically and with care. Be sure that your child has ditched the paci and learned how to soothe herself to sleep by the age of 2. Have a Soft Sing-a-Long—Singing your baby to a deep slumber aligns with one thing scientists know for sure about humans and sleep: Soothing music can help put us in a trance and relax us so that our brains are more prepared to soak up those essential zzz’s. You can softly whisper-sing to baby if you’re awake yourself or use a music sound machine so you don’t have to expend much energy. There are also tons of sleep sound YouTube videos and apps that you can have do the singing for you. Swaddle and Coddle—We know that it’s not wise to put the baby to bed with anything in the crib besides a tight-fitting crib sheet. We also know that swaddling helps mimic the environment of the mother’s womb, which comforts baby and helps her get back to sleep. So how do we find a good balance between the two? Luckily, the AAP does recommend middle of the night swaddling, but only when it’s done the safe way. According to the organization, you can swaddle baby at bedtime until she’s two months old, but only when using swaddle blankets that won’t come unwrapped during sleep. 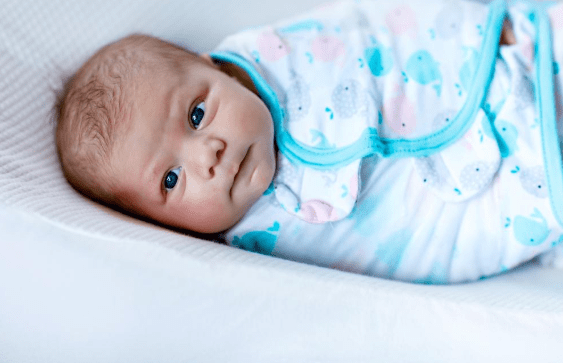 A wearable blanket is a great way to provide baby with the soft, soothing feel of swaddling without any risk that it might loosen or open at night. Know How to Find Everything in the Dark—Ask any nursing mother and she’ll tell you that, during those early few months of constant wake-ups, it’s really hard to think straight in the middle of the night. Fussing with things in the dark or tripping over items on the floor creates commotion—not to mention the risk for injury—and we all know that commotion can disrupt baby’s sleep. Use soft lighting and dimmers so that you can safely see where you’re going without rattling baby to a fully awake state. Also, make sure that you know exactly where everything is so that you can access items without too much rifling around. Wait to Change Her Diaper—Unless absolutely necessary, there are some times when you can get away with not changing your little one’s diaper every time she wakes up. Like bright lights and noise, diaper changes can jerk baby from a half-awake state to a wide-awake state, which can prevent her from getting back to a deep sleep in a timely manner. Of course, there will be times that you will need to change baby. In these instances, do your best to make it a soothing experience by using warm baby wipes and diapers that are made of soft, cloth or cloth-like materials (perhaps cloth diapers) that don’t make much noise. If you’re a new parent, know that safe, healthy sleeping practices should come with a bit of trial and error and time. Just because something worked for another parent doesn’t mean it will work for you and vice versa. Be patient and know that it will get easier with time as you discover what makes baby calm and comfortable enough to soak up some deep sleep.